Need the perfect gift for somebody on your holiday list or just want to do something nice for a shooter in your life? A $50 gift card is the perfect idea! 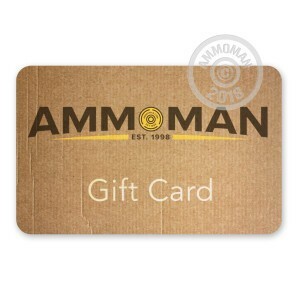 Good toward anything at AmmoMan.com, this gift card is redeemable online and makes for an awesome stocking stuffer, graduation gift, or thank you to the ammo man or ammo woman in your life. Know a shooter but don't know what kind of firearm he or she shoots? This is the ideal solution as the gift card can be used for any caliber or accessory on our site. With a wide array of in-stock ammo, you know the recipient will be able to find exactly what they need, thanks to you! Your gift card will be delivered via email quickly based on the information you provide about the fortunate recipient!